ARK/USD has shown recent signs of stabilzsation at the $0.50 handle. The market is now grinding higher as bulls head toward the $1.00 mark. Support moving forward: $0.7653, $0.7048, $0.6185, $0.5671, $0.5222, $0.50. Resistance moving forward: $0.8260, $0.9368, $0.9782, $1.00, $1.15, $1.23, $1.33, $1.56. Ark has undergone a price hike totaling 2.79% over the last 7 days of trading. The ARK/USD market is now trading at a price around $0.81, at the time of writing, as the bulls now gear up to aim for $1.00. The Ark project is presently ranked 71st in terms of overall market cap, with a total market cap of $85 million. The cryptocurrency has seen a 15.79% increase in price over the past 30 trading days as the market starts to show some signs of stabilization. The 19-month old project is now trading at a value that is a steep 91% lower than its all-time high price. Let us continue to assess market action for ARK/USD over the long term. 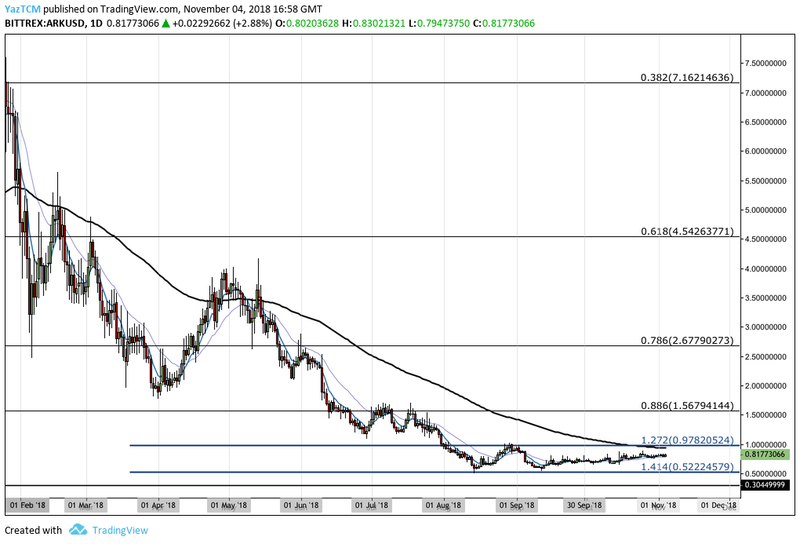 Taking a look at the long-term overview above, we can see the downward trend of ARK/USD. Price action has sustained a steep decline for the majority of 2018. The downtrend has recently shown signs that it may have run out of steam after reaching support at a downside 1.414 FIbonacci Extension level priced at $0.5222 during August 2018. As ARK/USD approached this area of highlighted support, we can see that the buyers within the market started to re-enter the market (or add to their positions), causing price action to halt its decline. Ever since reaching this area of support, the ARK/USD market has continued to trade sideways. Let us proceed to analyze ARK/USD a little closer over the past 3 months and highlight any areas of potential support and resistance moving forward. Analyzing ARK/USD at a closer perspective, we can see that the support at the downside 1.414 FIbonacci Extension level (drawn in blue) priced at $0.522 was strengthened by a shorter-term downside 1.272 Fibonacci Extension level (drawn in red) priced at $0.518. As price action reached this combined area of support, the decline had reached exhaustion and we can see a price surge emerge which totaled an increase close to 100%. The market had started at a low price of $0.5071 on August 14, 2018, then continued to climb to a high of $1.02 on August 29, 2018. After placing the high, ARK/USD went on to fall until reaching support at a short-term .886 Fibonacci Retracement level (drawn in green) priced at $0.5671 during September 2018. The market then continued to climb from this point to where it is currently trading, at resistance provided by the short-term .382 Fibonacci Retracement level (drawn in green) priced at $0.8260. Looking ahead in our bullish scenario, if the buyers can climb above the resistance at $0.8260, they will meet significant resistance above immediately at the 100-day moving average which currently floats at the $0.9368 handle. Further resistance above this can then be expected at the $1.00 round number handle. Provided that the bulls can continue to press ARK/USD higher, we can expect more resistance above to be located at 1.272 and 1.414 Fibonacci Extension levels (drawn in blue), priced at $1.15 and $1.23 respectively, followed by resistance at the 1.618 Fibonacci Extension level (drawn in blue) priced at $1.3368. If the bullish pressure continues to shoot higher than $1.33, we can expect higher resistance at the previous long-term .886 Fibonacci Retracement level (drawn in black) priced at $1.5679. On the other hand, in our bearish scenario, if the buyers fail to break above the $0.8250 handle and push the market lower, we can expect immediate support beneath to be located at the short-term .5 and .618 Fibonacci Retracement levels (drawn in green), priced at $0.7654 and $0.7048 respectively. 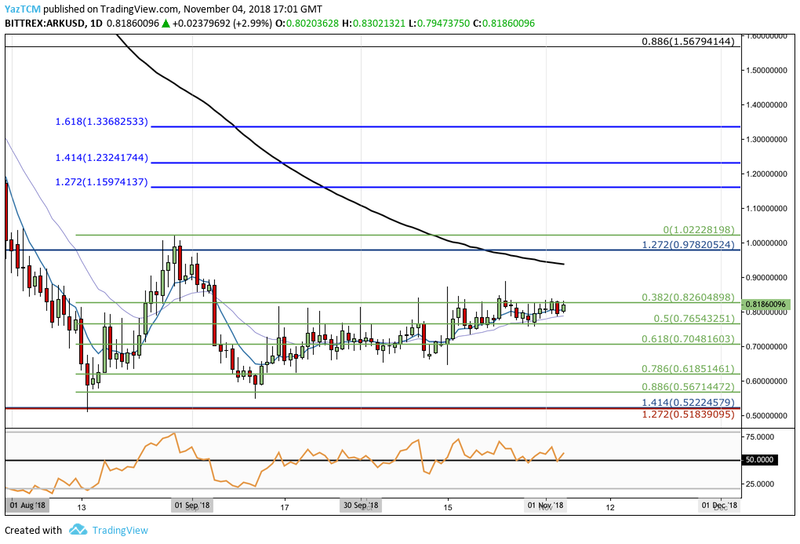 Further support beneath the $0.70 handle can be located at the .786 and .886 Fibonacci Retracement levels (drawn in green), priced at $0.6185 and $0.5671 respectively. If the sellers drive price action even lower, then more support can be located the previous long-term downside 1.414 Fibonacci Extension level (drawn in blue) priced at $0.5222. The RSI for ARK/USD has remained above the 50 handle for the entire second half of October 2018, indicating that the bulls are still willing to grind higher. If the RSI continues to remain above 50, we can expect this market to continue to press higher. As the majority of markets are still largely coupled with Bitcoin, it is always important to always take an equal look at the altcoins market against Bitcoin. Let us take a look at ARK/BTC over the long term and assess market behavior. From the long term outlook above, we can see that Ark had also been struggling against Bitcoin for the majority of the year, until a solid form of support was found at a downside 1.414 Fibonacci Extension level priced at 9427 SATS during August 2018. 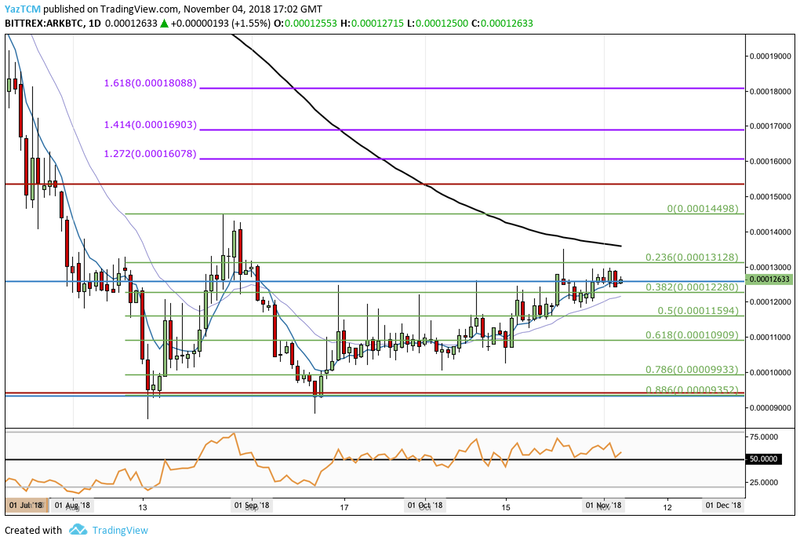 After ARK/BTC had reached this support level, the market rebounded from its downtrend and began to trade sideways. 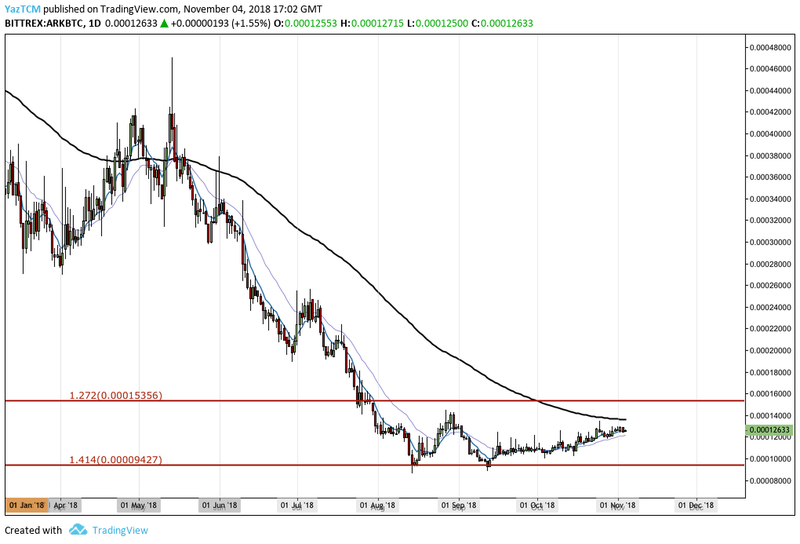 Let us take a closer look at ARK/BTC over the short term and highlight any potential areas of support and resistance. 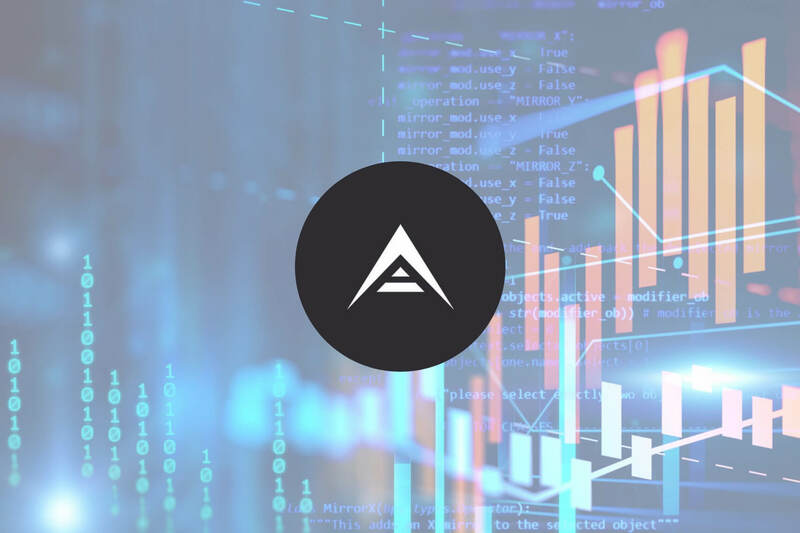 Taking a closer look at ARK/BTC, we can see the market rebound occurring after price action had met the support at the downside 1.414 Fibonacci Extension level outlined above. Price action started from a low of 8,656 SATS on August 14, 2018 and continued to rise to a high of 14,499 SATS on August 27, 2018. This was a price increase totaling 65% from low to high. The market returned to the same area of support around the 9,427 SATS handle during September 2018 but has been continuing to climb ever since. Price action is now trading just above support at the .382 Fibonacci Retracement level (drawn in green) as ARK/BTC presently trades at 12,633 SATS. Moving forward, if the bulls can continue with their buying to push the market higher, we can expect immediate resistance above to be located at the short-term .236 Fibonacci Retracement level priced at 13,128 SATS, followed by the 100-day moving average priced at 13,600 SATS. If the buyers can continue to climb above the 100-day moving average and then above the 15,000 SATS handle, they will encounter higher resistance. This resistance is located at the previous 1.272 Fibonacci Extension level (drawn in red) priced at 15,356 SATS, followed by the short-term 1.272 and 1.414 Fibonacci Extension levels (drawn in purple), priced at 16,078 SATS and 16,903 SATS respectively. The final level of resistance to highlight is the 1.618 Fibonacci Extension level (drawn in purple) priced at 18,088 SATS. Alternatively, in our bearish scenario, if the sellers drive ARK/BTC lower, we can expect immediate support at the .382 and .5 Fibonacci Retracement levels (drawn in green), priced at 12,280 SATS and 11,594 SATS respectively. Further support below this can then be expected at the .618 and .886 Fibonacci Retracement levels (drawn in green), priced at 10,909 SATS and 9,352 SATS respectively. The RSI is also producing signs that the bulls are in comfortable control of the momentum within the market as it trades above the 50 handle.